Not only do these pallets have a new life, but they ADD life to this living space. The orange 'frame' is a perfect touch too. The installation on the left has an artistic quality about it as well, no? When Jen needed a cost-effective kitchen island for her rental, she turned to pallets. She'd had success before using them to re-do a bookcase, so this was familiar territory for her. First in the island's creation was building a frame--the wood for which, Jen notes, was the only lumber that was actually purchased for the project. After that, it was just a matter of applying the weathered pallet wood in strategic places to highlight it. Interior shelving was added for hidden storage. To see more pictures and read more about the project, please visit Noting Grace. As far as contemplating any hygiene issues you may have with the project, I'll leave that up to you to discuss in the comments below! 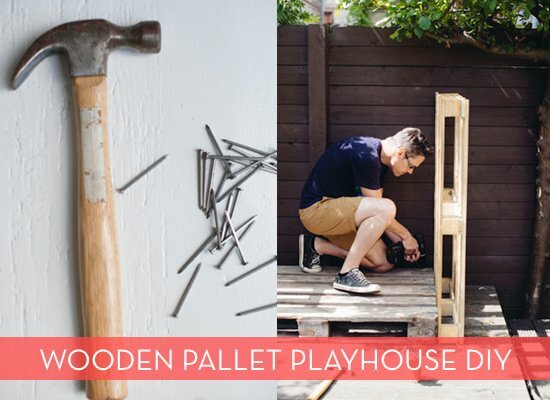 The internet has been home to plenty of DIY projects that involve pallets. In fact, we've featured quite a few here on Curbly as well. I don't think I've ever seen one used to create a playhouse for the kiddos though. Until now. Check out this clever way to build a cozy fort-like oasis for kids. Tina Fussell came up with weekend playhouse project idea for A Subtle Revelry recently, and I can't think of a kid between the ages of 3 and 13 who wouldn't love one of these in their own backyard. It's the perfect spot for a tea party with a couple of friends (or stuffed animals). Just be sure to select wooden pallets that haven't been treated with insecticides to keep your playhouse chemical-free. For more photos, visit A Subtle Revelry. So clever and yet so simple, this rolling outdoor table was made using 2 - 4' x 4' wood pallets, 1 - 4"x4", 4 caster wheels, some L-brackets and screws and gray stain. Visit Joy Ever After for a quick how-to. Isn't it amazing how this pallet floor was laid out? I really like the square pattern starting in the middle of the room. Check out how it was done here. For the entire tutorial, visit Re-Nest. For the entire tutorial, visit Shelterness. Vertical gardens are all the rage these days, but buying everything you need for a decent looking setup can get quite expensive. Fortunately, where there's a will there's a way (and a cost-effective DIY version): a space-saving vertical garden is as easy as finding a pallet! After you've gathered everything you need and acquired a pallet, it's time to get down to business. Check out Life on the Balcony for the full tutorial and some more pretty photos! Meanwhile, what flowers and/or plants are you excited to plant this year? Our yard needs some serious work, so I'll be hitting up the local nurseries pretty soon. I can't wait! *Fern makes a good point about pallets: if you're planning on growing anything edible, make sure you find a pallet that has been heat treated as opposed to fumigated. There are nasty, nasty chemicals in the fumigated kind that could find their way into your veggies. Can you make an entire home out of wood pallets? I-Beam's Pallet House is indeed made out of shipping pallets. The original design was to provide temporary housing for refugees, however the same building concept could make very cool garden sheds and backyard studios too. According to Inhabitat, a basic 16" x 16" pallet home can be made with 100 pallets. For more information about this and other pallet homes, visit Green Upgrader. A wooden pallet, much like the one pictured above, was turned into an outdoor swing chair. Clever, no? This has got to be one of the most comfortable wood pallet projects on this list. Using four wood pallets and some decent carpentry skills you can easily make this great table as a weekend project. It can be customized based on the sizes of the pallets you are using, finishing the table with oil, wax, or a polyurethane/deck sealer to add weather resistance, use a more expensive wood like cedar as another weatherproofing alternative, or scale the table down by making it half as long. This table would be great for both indoor or outdoor uses. For full instructions check out Readymade: Recycled Wood Dining Table! Friend, fellow blogger, and extraordinarily talented upholsterer, Shelly Lear (aka ModHomeEc Teacher) may describe her pallet turned ottoman as 'jaw-dropping' to grab our attention, but the expression is so very apt, I had to use it too. Yes, she used one of the actual pallets on the pile pictured above and turned it into the item below. Most of the materials she used to make it were free (she had the foam on hand), and the fabric was a remnant she spotted at JoAnn's for which she paid $5.99 a yard. She says that even if we'd have to buy everything retail to bust one out, it wouldn't set us back over $100. I spotted the project on Shelly's website, but she has posted the entire 'how-to' at Houzz. Click here to see it. Using untreated pallet lumber and a good deal of problem solving, this nursery on the Bower Power Blog has a rustic and awesome accent wall. Because the wood was free and they had a gift card on hand, it was a whopping $15! The minds behind this baby room can't emphasize enough the need for safe pallet lumber for this project, especially since it is a baby's room. If it still makes you nervous, this same look can be replicated with brand new wood that you rough up a bit. But... Wood Paneling??? Isn't that what everyone is ripping out of their houses these days? Personally, I think it is the rustic, mis-matched, horizontal look that completely separates this accent wall from your grandma's wood paneled walls. What do you think? To see the whole process, head on over and check it out! Tel Aviv-based design studio Junktion focuses solely on creating new things from old stuff. They've upcycled a car trunk hood into a sofa, a collection of metal teapots and collanders into a chandelier, and old suitcases into medicine cabinets. But their most DIY-friendly project would have to be this pallet-turned-shoe rack. Depending on the state and style of your pallet, you wouldn't have to do much more than clean it and (maybe) remove a few boards. You could even paint it if you're feeling fancy. Something like this would be perfect for mudrooms or garages: a dedicated spot for muddy yardwork shoes, hiking boots, cleats, etc. I like the idea of mounting it a little off the floor for a "cleaner" look, but leaning it against the wall would work as well. What do you guys think? Also, be sure to check out more creative upcycled projects from Junktion! The poster of this image calls it a 'playhouse', but it's really a pint-sized covered bridge. Could be a sweet focal point in the garden or a shady interlude on the way to the play area. Looks like only four pallets would be necessary (2 for the sides and 2 for the roof). Some creative angle cuts and a hammer and some nails and we're good to go. Now that you've got your vertical pallet garden up and growing, it's time to sit back and soak in some rays from the comfort of a super cool pallet lounger! DIY extraordinaire Titti of the blog Shoestring Pavilion created these hip garden loungers from a pile of discarded pallets and 2x4s. Oh, and some bright red paint, of course! If you're looking for a new outdoor project to kick off the summer season, this is it! Check out the full tutorial right here. Make a Compost Bin from Shipping Pallets! Remember my DIY paver stone patio and walkway project from the summer? Well, those paver stones came to us stacked on (what else?) wood shipping pallets ... 'lotsodem. For a couple months, those pallets sat out behind our garage while I mulled over what to do with them. Neighborhood bonfire? Wild turkey shelter (yes, we have dozens of wild turkeys around)? Skate ramp (wait, I don't skateboard)? I started by unwrapping my new miter saw and cordless drill that I got from Amazon.com's Home Improvement store; actually, this was the best part of the whole project. Since this was going to be a simple box, I didn't really plan it out or measure; I just found a flat patch of dirt next to the driveway (sort of behind the garage), and stood the pallets on end to get a feel for how they'd go together. Next, I trimmed a few of the edges off and cut one pallet in half to make the front of the box (so I don't have to hoist yard junk and leaves quite as high when dumping them in). Then I just screwed the pieces together; for this I tried out a pair of Ansell ProjeX medium duty gloves I was sent for review. I'm a big fan of protecting my fingers, and only recently discovered that a good pair of dextrous work gloves really makes a difference (I always just used those one-size-fits-all yard gloves for everything). The Ansells felt really solid and well-constructed, and I especially like the little plastic knuckle guards on the back (even though it looks a little silly). (Note: I wasn't paid for this reviewing these, just got a sample pair of gloves to try out). Right now we're just using this for yard waste since we don't do a whole lot of food composting. It's not perfect (it'll probably fill up pretty quickly), but it's better than what we were doing before, which was dumping leaves and clippings in a pile under the lilac hedge. Plus, if and when it does fill up, we can easily tear it down and have that neighborhood bonfire I was talking about! Nina Tolstrup of Studiomama makes furniture out of wood pallets, which she sells. She also sells plans to make some of the furniture as well. The up and downside for Ms. Tolstrup is that her for-sale plans are simple, which also means they're knock-off-able using just the pictures of the completed projects. Take, for example, this lounge chair. It could be an inexpensive alternative to a traditional Adirondack lawn chair. To help create your schematic, you might want to consider this evil-genius method of using Photoshop. This project combines the idea behind paint can planters and garden walls pretty perfectly, don't you think? While Rachel from Smile and Wave used pallets as the support for her vertical garden, you could easily use scrap wood from other sources if you're concerned about the safety of pallets. One element I really love is the colorful patches of weathered paint throughout! Check out how to build one of these vertical garden walls over on A Beautiful Mess. What do you think? Spot on...right??? For Amy's entire tutorial, please visit DIY Candy.